Google Scholar [https://scholar.google.com/] searches the web for journal articles, theses and dissertations, academic books, conference papers, technical reports, case law, and abstracts from academic publishers, professional organizations, online repositories, universities, and other web sites. 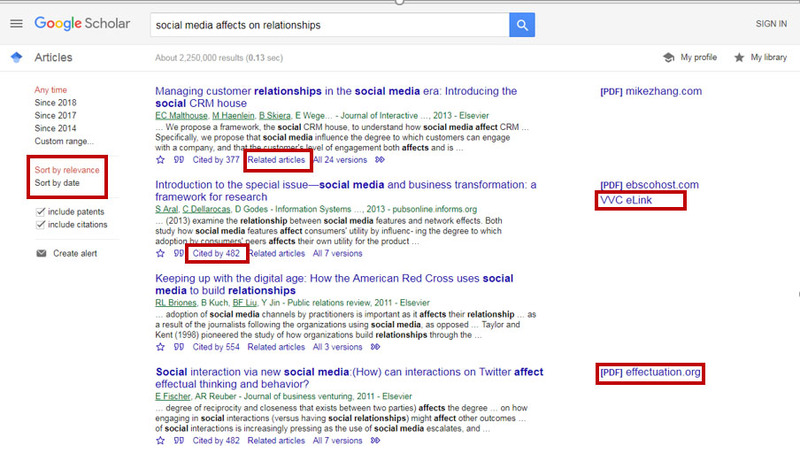 Google Scholar does not provide full-text for every article, and some publishers may require you to pay an access fee to read the full article. If the full article is available, there will be a link labeled [PDF] or [HTML] to the right of the citation. Full-text articles are freely available when they are published in an open access journal, published on an author’s personal or academic website, or posted at a professional organization website. If the article is not available, you may try clicking on “All Versions” to see alternative sources for the article. If you find an article that is relevant for your topic, you can expand your results for articles on similar topics by clicking on “Related Articles” or “Cited By” located beneath the article. If you are logged in to your Google account, you can use the “My Library” option to save a list of articles by clicking on the STAR icon beneath the article. Results are ranked by relevancy, using criteria such as full-text and keyword search, publisher, author, and how often or how recently the article was cited by other scholarly literature. Results are NOT ranked by date, but there is an option to sort articles by publication date using limiters in the left-hand column. Advanced search features allow you to search by publication title, author, date and combine search fields using Boolean operators. Google Scholar can supplement your research, but it does not replace library databases, because results may not be full-text, there is no way to limit to peer-reviewed scholarly articles, and content is limited.